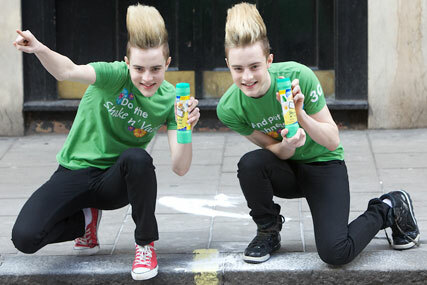 LONDON - Jedward, the 18-year-old eccentric twins who found fame on 'X-Factor', are to sprinkle their musical talents on the new campaign for 1980s favourite brand Shake n 'Vac. The duo have gone into the recording studio and remixed the Shake n ‘Vac jingle with their own unique sound. The boys have previously covered famous tracks like 'Ice, Ice Baby' and the 'Ghostbusters' theme tune. Fan of Shake n ‘Vac can get involved in the online campaign by submitting their own creative version of the ad via video or still photographs. Marketing reported last week that the The Shake n' Vac housewife is to recreate her famous dance to commemorate 30 years since the famous TV ad first aired. The cult ad for the powder carpet freshener starred the actress and singer Jenny Logan, and ran throughout the 1980s. Logan, now a 69-year-old pensioner, will appear in an online viral campaign rolled out next month. But there are no plans for her to grab her vac and return to television screens. Logan said: "Being a part of the Glade Shake n' Vac advert was such a fun experience, I can't believe it has been 30 years since it first aired. People still come up to me singing the Shake n' Vac jingle today." SC Johnson, the makers of Glade Shake n' Vac, claims the brand has sold nearly 300 million bottles in the UK since the ad first showed in 1979.